The next big move for medical journals is to move into the digital domain. 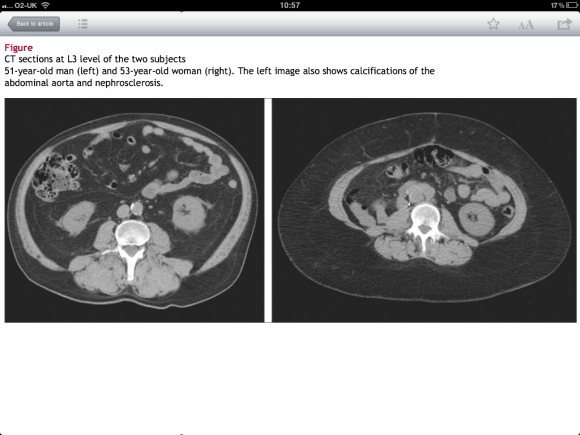 The medical community has already seen a number of prestigious journals such as the NEJM and BMJ launch electronic versions which are available on the iPad. Electronic journals offer a number of advantages over traditional paper journals such as the ability to carry an entire back catalogue of issues, save, share and favourite articles for further reading. 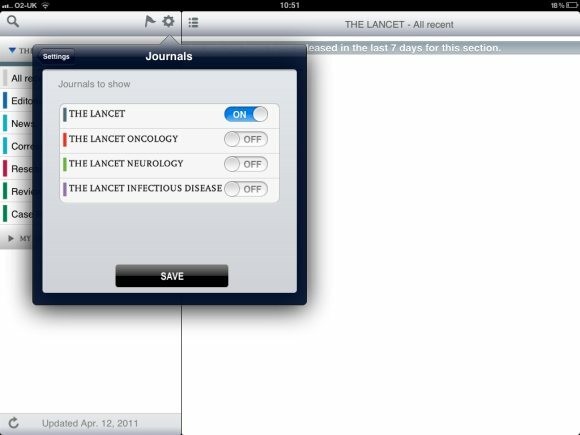 One of the latest journals to join the range of digital journals is The Lancet. 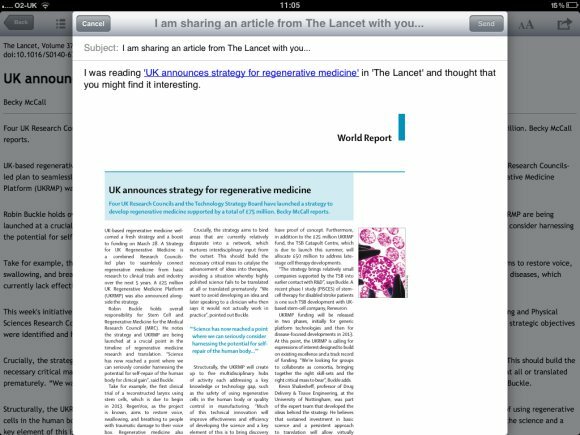 The Lancet app is a free app for the iPad which offers current subscribers rapid access to recently published content from The Lancet and other specialty publications; The Lancet Oncology, The Lancet Neurology and The Lancet Infectious Diseases. Launching the app brings the user to the home screen which allows easy access to the various sections of The Lancet (see screenshot). The app is well designed and easy to interact with. 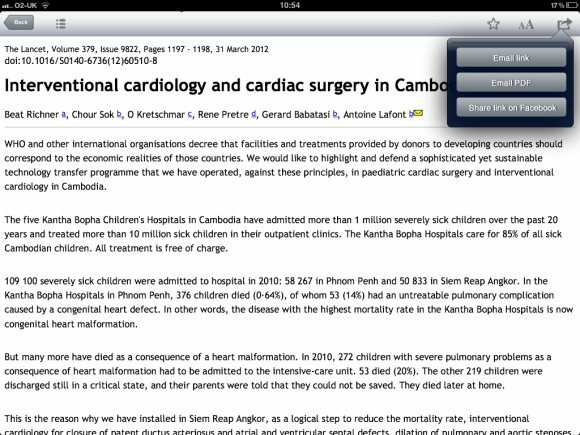 It is easy to mark an article as a favourite (by tapping the star) and there is a similarly useful unread blue button. 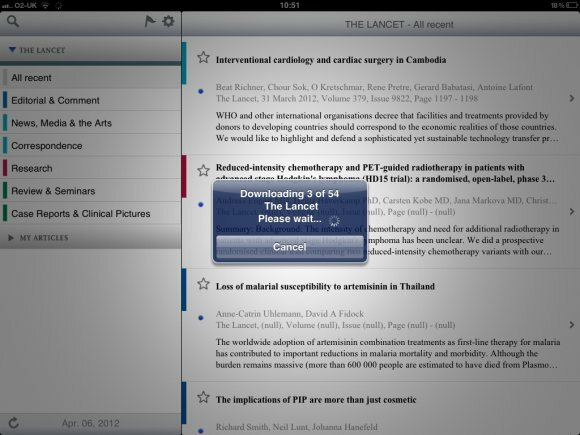 The Lancet doesn’t take advantage of Apple’s Newsstand to automatically download the latest content however there is a feature where it regularly checks and updates content. There is an individual My Articles section which contains all the starred articles, a history of articles and any notes that have been made. There is a search option which covers the archives of the Lancet which makes finding articles relatively simple. 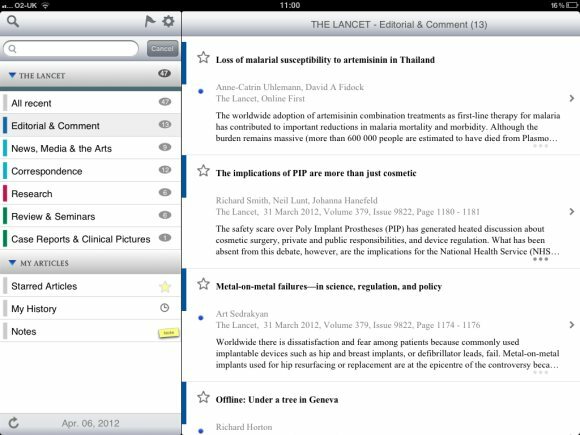 The Lancet app differs from other electronic journal apps in that it is possible to annotate and highlight articles and save notes for future reading. There are options to change the text size as well as export articles via email or Facebook. Images are clearly displayed and can be zoomed in using touch gestures. Authors can be emailed from within the app by simply tapping their contact details which will bring up an email draft. Citations are also linked to PubMed using an internal browser making it is easy to continue further reading. 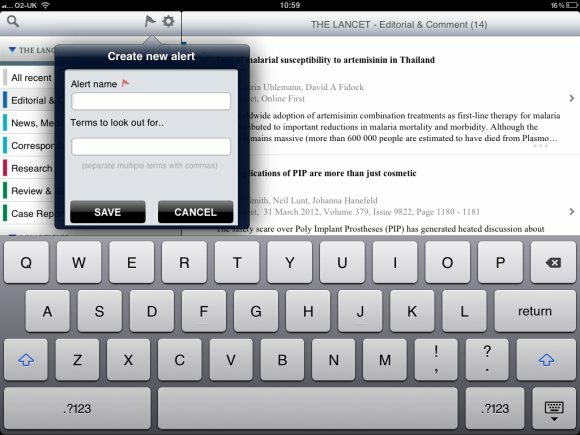 The developers behind the Lancet app have also included a very helpful addition in the form of Keyword alerts. The alert function will keep you up to date with specific topics and tools which can be handy if you have an ongoing research project. 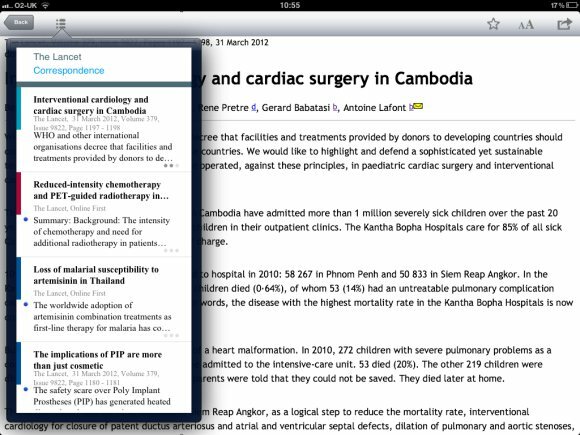 The free app allows access to abstracts and some content but not full text access. This is reserved for subscribers who wish to read on their iPad. Great, will definitely look into this later as I already have a subcription to the Lancet.